Published: Sept. 27, 2016 at 05:28 p.m. Updated: Sept. 30, 2016 at 09:40 p.m.
Much of the credit is due to the Vikings' defense. The unit faced its toughest task of the young campaign: take down the reigning NFC champion Panthers by ending their 14-game home winning streak. They needed to look only two weeks earlier -- to Denver's 21-20 win over Carolina -- to see how it could be done. So how did they do it? It wasn't a tale of blinding speed that allowed the Vikings to get to Newton eight times, but was instead rooted in how much head coach Mike Zimmer and defensive coordinator George Edwards trust their front four. The faith looks to be unshaken, as Minnesota went with a nickel package to defend the pass (four defensive linemen, two linebackers, five defensive backs) on an astounding 54 of 72 defensive snaps (75 percent), according to Next Gen Stats. Minnesota tossed varied fronts at Carolina, utilizing three different defensive ends (Everson Griffen, Brian Robison and Danielle Hunter) in offset wide nine looks that gave Panthers tackles Mike Remmers and Michael Oher fits all afternoon. 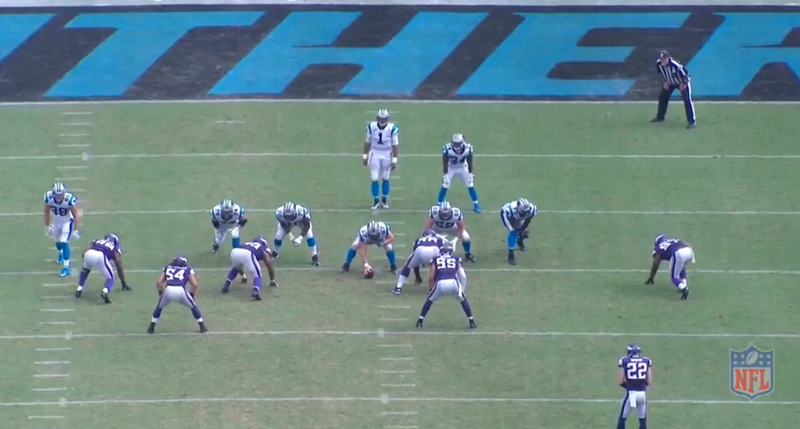 Below, Griffen is in the wide nine, lined up before his sack on Newton on a possession that produced two Minnesota sacks (the other on the part of Anthony Barr). At one point in the fourth, with the Vikings owning a 12-point lead, both ends spread out to the wide nine and pinned their ears back with no need to respect contain responsbilities. The alignment provided additional space to allow Robison and Griffen to enter full-speed rushes before engaging the tackles. On Griffen's sack early in the fourth, he gave himself 4.36 yards of free space between he and Oher before the ball was even snapped, hitting a top speed of 11.72 mph, as compared to Oher's pass-drop speed of 8.37 mph. Griffen covered 16.4 yards, dropped Newton for a loss of 10 and was the second-fastest member of the front seven on the play, trailing only linebacker Chad Greenway, sprinting to the flats in coverage. The Vikings also showed the threat of multi-gap blitzes before multiple plays, walking a variety of defenders up to the line of scrimmage before either dropping or blitzing. The most startling statistic: Minnesota blitzed on just 36.4 percent of plays (all out of a 4-2-5 Nickel package), nowhere near the top-five blitzing teams of Week 3 (Detroit led at 57.7 percent). Those five units combined for seven sacks. Minnesota finished with eight. 1. Travis Kelce is fast. The Chiefs tight end recorded the four fastest speeds of those at his position with the ball, topping out at 18.98 mph. 2. Minnesota again has one of the week's fastest players. In Week 3 it was return man Marcus Sherels, hitting 21.17 mph to lead all ball carriers on touchdown-scoring plays. 3. Quarterback Jacoby Brissett's stunning performance on Thursday Night Football included a touchdown run, which was also good enough to lead all quarterbacks, besting Tyrod Taylor's 19.94 mph mark with a speed of 20.33 mph. 4. Rookie Ezekiel Elliott traveled the most distance as a ball-carrying running back with 648.5 yards. Receiver/gadget quarterback/Mr. Do Everything Terrelle Pryor covered the most yards as a ball-carrying receiver this week, traveling 377.8 yards. 5. Buccaneers wideout Mike Evans and Steelers receiver Antonio Brown led their position groups in receptions while lined up out wide, tied with 10 each, though Evans' 132 yards edged out Brown's 130. Both came in losing efforts. 6. Jameis Winston's NFL season-high 58 passes had the Rams on the run on Sunday, and it showed late in the fourth before a weather delay offered them a reprieve. Los Angeles defenders traveled 16,576 total yards in the close victory. 7. Despite Indianapolis's reputation for a weak offensive line, quarterback Andrew Luck had the longest average time to throw in Week 3 with 2.98 seconds per pass.